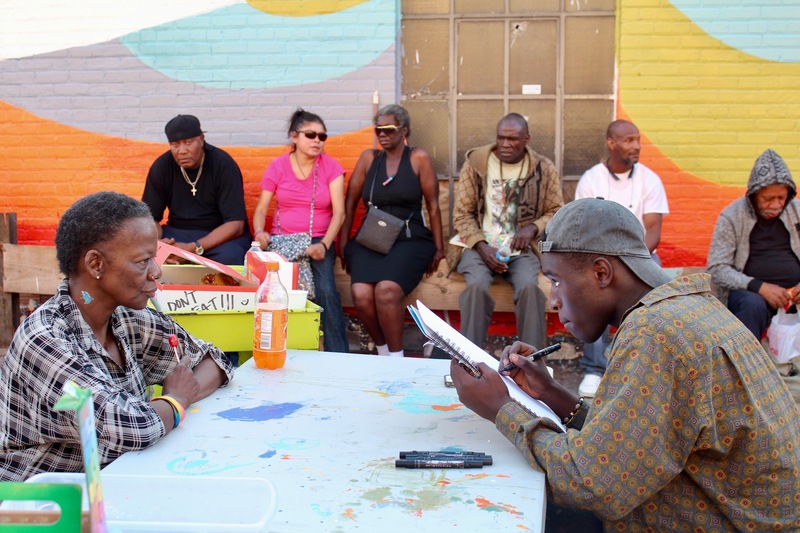 Heart of the Community is a signature outreach program of Project for Public Spaces and Southwest Airlines, with a mission to build connections that bring people together and strengthen communities for a more resilient future. It is true, what people say; that art can heal. But what if art can do more than that? Above and beyond that old maxim, a platform for the arts can bring a whole community to the table. The Hennepin Theatre Trust is exploring the intersection of public space, social justice, and local creativity as it works to improve the historic Hennepin Theatre District. Surpassing even the most ambitious examples of creative placemaking, the Hennepin Theatre Trust made a journey from “talking the talk” to truly “walking the walk” of community-building through the arts. Despite the presence of grand theatres boasting Broadway musicals alongside music venues played by homegrown legends like Bob Dylan and Prince, even locals consider parts of West Downtown Minneapolis to be unsafe. So naturally, when the Hennepin Theatre Trust (HTT) was awarded the Southwest Airlines Heart of the Community grant to bring new life to the area, the first thought was to make the area more comfortable and appealing to theatre-goers. With spaces that encourage ticket-holders to stick around for a drink or some shopping, the area could shrug off its unsavory reputation and become a hot spot once more. Holding this goal in mind, in August of 2016, the Hennepin Theatre Trust and PPS kicked off the 5 to 10 on Hennepin program. Sponsoring events on sidewalks and in parking lots along the Theatre District, the plan was to bring the arts off-stage and into the community. 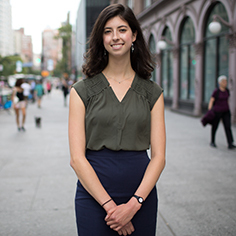 The events activated the streets with live music, artists’ markets, and food; a first step toward generating trust among individuals and organizations in the Theatre District. However, it soon became clear that the vision of making Hennepin Avenue more appealing to theatre-goers was not looking at the whole picture. Just down the street from Hennepin’s historic theatres is the Harbor Light Shelter, one of the largest shelters in the Midwest for those experiencing homelessness. Because Harbor Light closes its doors early each morning, many residents of the shelter depend on outdoor spaces in the West Downtown area. Making Hennepin Avenue safer and livelier was not, then, only a question of engaging theatre-goers; it was a matter of actively including the voices of local people experiencing homelessness who rely on Hennepin Avenue to be a safe haven. HTT began to lift the curtain on who uses public spaces in West Downtown Minneapolis, and why. Theatre organizations are always looking to break the fourth wall; focusing on outreach for better audience engagement. The strategy of least resistance is often focused on tickets, with the distribution of free seats seen as the best way to establish more diverse audiences. But, the value placed on filling seats alone leads arts organizations to lose sight of the needs of the broader community. Recognizing this, the Hennepin Theatre Trust (HTT) brought on local partners to get a better look at inclusive outreach. 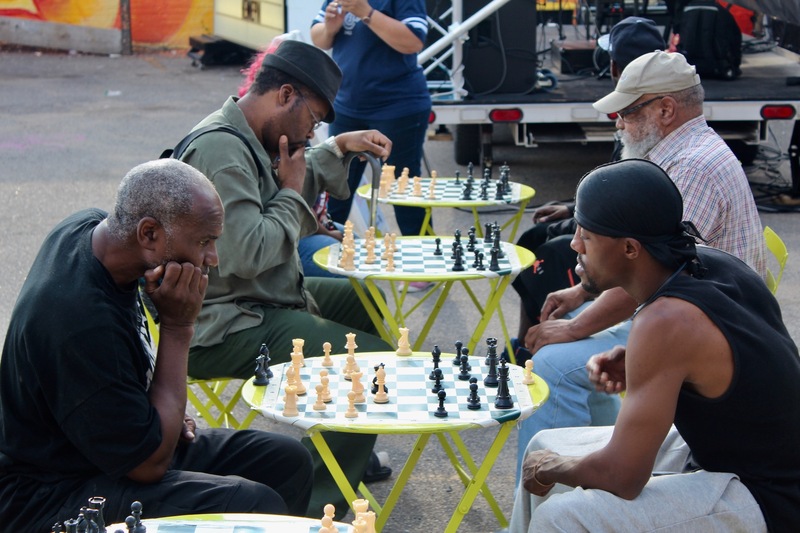 The MAD DADS, a trusted local group that maintains an active presence in engaging at-risk and homeless youth in public spaces around Minneapolis, brought their grassroots approach to establishing a place of welcoming and safety for everyone. 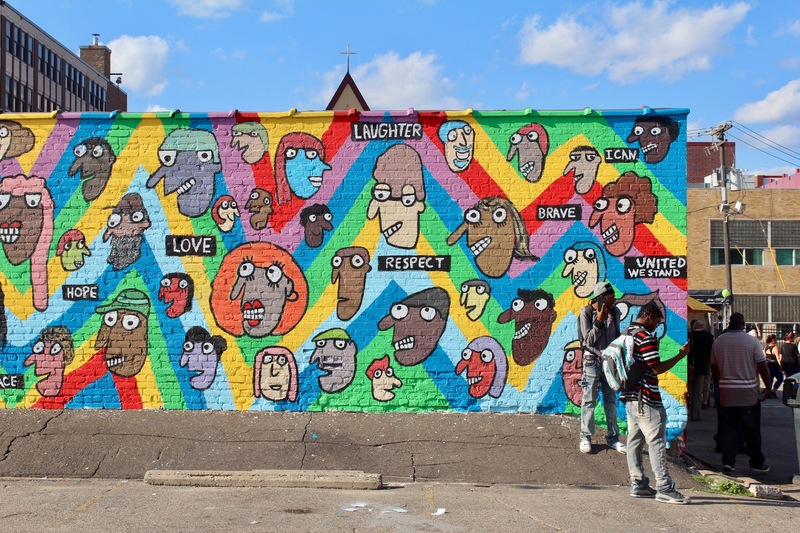 The Kulture Klub Collaborative, which provides arts programming to these same groups of young people, encouraged marginalized groups to express themselves in ways they hadn’t been able to, before. These three groups were natural collaborators; a shared interest in supporting the “last, the lost, and the least,” planted the seeds for a partnership to flourish and evolve. Soon, the partners started their joint projects to energize Hennepin Avenue. As noted by VJ Smith of MAD DADS; “Just investing in police, and just investing in more security, and just investing in more cameras is not the option.” The partners knew that the Hennepin Avenue area was already filled with talent and energy. 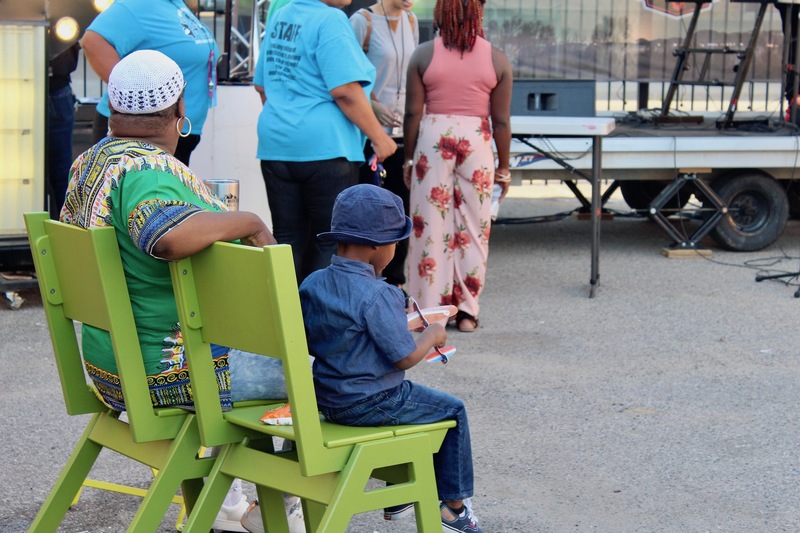 A mobile stage, artist market, artist stipend, and a multi-block “Roaming Street Festival” grabbed the attention of the neighborhood, with young people from the Kulture Klub Collaborative given the chance to perform and express themselves. 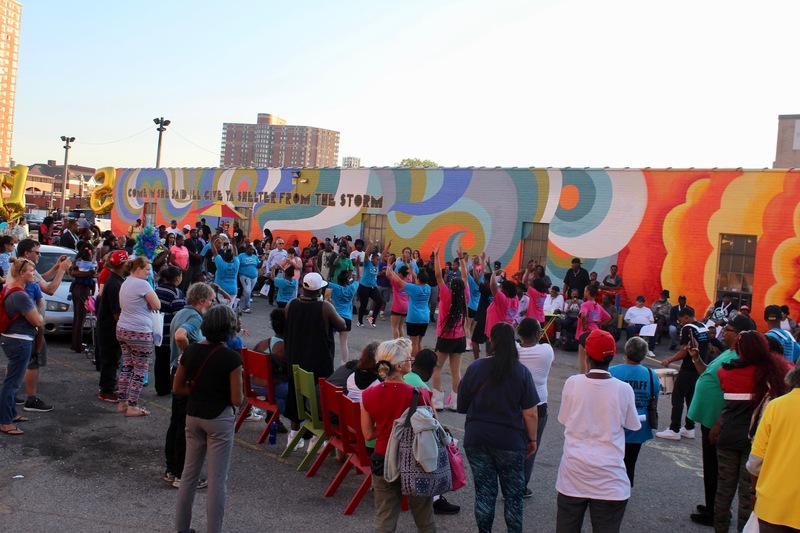 This August, the partners unveiled two new murals, celebrating the project with a festival that showed off the renewed spirit of Hennepin Avenue. Real conversations have begun between local partners and the people living in the area. The process unleashed the arts, and with it, the voice of the Hennepin Avenue community. Hennepin Theatre Trust CEO Mark Nerenhausen remarked that; “this isn’t something we did for the community, this is something we did with the community.” To culminate the Heart of the Community grant period, as the second largest state fair in the United States opened its gates this August to celebrate summertime and show off the best of local agriculture, the nearby West Downtown Minneapolis community had a celebration of its own. As part of the 5 to 10 on Hennepin event series, the parking lot adjacent to Harbor Light became a block party, with two new murals by local artists unveiled by the end of the night. The celebration brought everyone together, with familiar figures from MAD DADS chatting with local police officers, and aspiring musicians from the Kulture Klub Collaborative taking the stage. For an evening, the parking lot became what the Hennepin Theatre Trust had hoped for in the first place; a safe haven to enjoy the each other’s presence and creativity.